There’s no doubt that your wedding day will be one of the most important – and memorable – days of your life. People spend months, if not years, planning their big day, with friends and family all lending a helping hand to ensure that the wedding is truly magical. For most weddings, the bride and groom will invite close friends and family to the ceremony, and then invite more people to come along to the evening celebrations. So, when booking your evening venue, it’s important that it is large enough to easily accommodate your extended guest list. Other things to consider are seating, décor, entertainment, and space to store all your wedding gifts! Many people opt for traditional venues for their evening reception, such as hotels, manor houses or stately homes. If you are planning a summer wedding, you could consider hiring a marquee in the grounds of a hotel. That way, you can make the most of the outdoors, but you have the added protection of a covered space, just in case it rains. 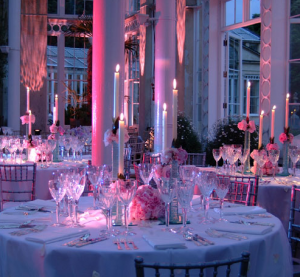 Décor can transform any bland space into the venue of your dreams. The décor is really down to your personal taste, but the key is to be consistent. If you’ve chosen white and cream balloons, don’t then decorate the tables with black and gold accessories. If you want your wedding ceremony to follow a certain colour scheme, then why not carry that colour scheme through to the evening? Themed evenings are also enormously popular: you could organise a casino night, with gambling tables and a ‘tuxedo and cocktail dress’ dress-code. Or, how about hosting your own outdoor ‘wedding festival’? You could hire a small stage for live acts, give guests wristbands and set up different tents for face painting, taking guests’ photos and a place to rest in between dances. Nowadays, entertainment stretches far beyond hiring a DJ for the night. So long as you’ve got the space, you can afford to get creative with entertainment. Instead of leaving cameras on the tables and trusting your guests to take photos, why not hire a fun photo booth for the night, and supply some fancy dress costumes? You could also hire a magician or comedian to entertain guests as they arrive. One popular choice for summer weddings is to transform the outdoors into a vintage fairground. You could hire or make your own traditional games, such as hoopla, buzz wire, a coconut shy, hook a duck, or ball in bucket. You could even set up your own candyfloss or popcorn stall for hungry guests. If you do have a vintage funfair, make sure you hire a professional photographer to take lots of pictures of you and your guests in action. When it comes to evening catering, chances are that you, your close friends and family will still be a little full from the three-course meal earlier in the day. On the other hand, guests who have just arrived for the evening may be hungrier. For this reason, a buffet is often the best option when it comes to evening fare. Serving up a selection of tasty treats means that your guests can pick and eat whatever – and whenever – they like. However, instead of loading all the food on a table in the corner of the room, it may be better to hire a team of professional catering staff. They can be responsible for handing out a glass of bubbly to each guest on arrival, and could walk around with canapés at different times during the evening. What Exactly Does A Bodyguard Do?